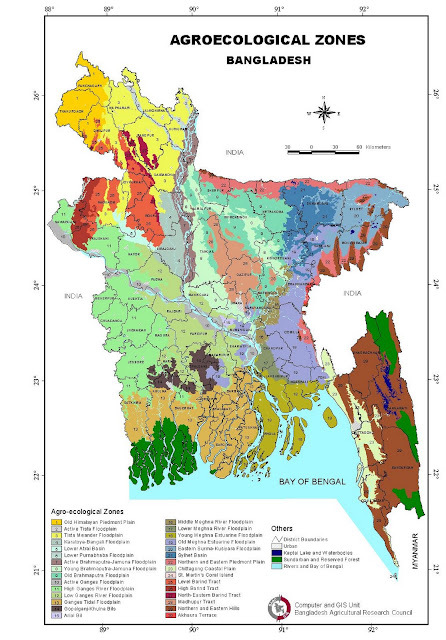 HomeVegetable farming in Bangladesh.map of Bangladesh.culture of Bangladesh.vegetable list .Vegetable farming in Bangladesh. Vegetable any herbaceous plant whose fruit, seeds, roots, tubers, bulbs, leaves etc are used as food. Nearly 100 different types of vegetable comprising both local and exotic type are grown in Bangladesh (table). 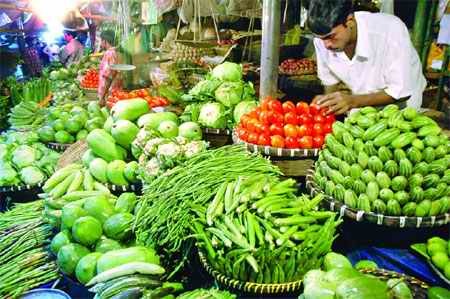 Vegetable is important for nutritional, financial, and food security in Bangladesh. However, the availability of vegetable is only about 1/5th of the recommended requirement of 200 g/person/day. Area and production The area under vegetable farming increased from about 1,71,830 ha to about 1,95,951 ha during 1990-1997. Likewise, the production of vegetable also increased from about 1.09 million m tons to about 1.29 million m tons during that period. However, summer vegetable cultivation is constrained by adverse climate and pest attacks. The major winter vegetables are cabbage, cauliflower, tomato, brinjal, radish, hyacinth bean, bottle gourd, etc while major summer vegetables are pumpkin, bitter gourd, teasle gourd, ribbed gourd, ash gourd, okra, yard-long bean, and Indian spinach among others. Some vegetables like brinjal, pumpkin, okra, and red amaranth are found to grow in both the seasons. Vegetable production on homestead Vegetables differing in morphology, growth habit, light, and nutrient requirement are grown in the homestead under complex multiple cropping system. Traditionally, farm families grow vegetables using local varieties and indigenous technologies mainly for family consumption and sell their surplus production. Women play the dominant role in this system. Vegetable production for commercial market Commercial production in field plots combine improved and indigenous technologies under irrigated and rainfed conditions. In this system, use of high yielding varieties/hybrids, close planting, multiple cropping, efficient nutritive and field management along with proper marketing management are practised. Some vegetables have localised areas of production because of favourable agroecological condition, and better marketing infrastructure. Pointed gourd in Bogra, onion in Faridpur, hyacinth bean in Chittagong, early cauliflower in Tangail, tomato in Jessore and Nawabganj are some of the examples of concentrated zones. Nowadays, vegetables like bottle gourd, yard-long bean, okra, teasle gourd, French bean are being grown for export market on a limited scale. 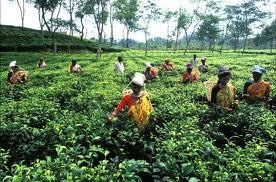 Vegetable farming for seed production The annual requirement of vegetable seed is about 3000 m tons. Unavailability of good quality seeds of improved varieties is a major constraint in vegetable production. Only about 4% of the total requirement of vegetable seeds are supplied by the public sector, 10% are imported, and the remaining demand is met through farmer to farmer exchanges, and local seed companies. Pests Cruciferous crop (cabbage, cauliflower, knol-khol, lettuce, radish, etc): Caterpillar, Spodoptera litura (Lepidoptera: Noctuidae). Solanaceous crop Brinjal: Shoot and fruit borer, Leucinodes orbonalis (Lepidoptera: Pyralidae); Red mite, Tetranychus sp. (Acarina: Tetranichidae); Epilachna beetle,Epilachna vigintioctopunctata, E. dodecastigma, and E. corupta (Coleoptera: Coccinellidae); Tomato: Aphid, Aphis craccivora (Homoptera: Aphididae); Fruit borer, Helicoverpa armigera (Lepidoptera: Noctuidae); Potato: The potato tuber moth, Phthorimaea operculella (Lepidoptera: Gelechiidae); Aphid, Myzus persicae(Homoptera: Aphididae). Leguminous crops Flower bud and pod borers: Maruca testulalis (Lepidoptera: Pyralidae); Euchrysops cnejus (Lepidoptera: Lycaenidae); and Heliothis armigera(Lepidoptera: Noctuidae). Cucurbit crops (gourd, cucumber, etc): Melon fruit fly, Dacus cucurbitae (Diptera: Tephritidae); Pumpkin beetle, Raphidopalpa (Aulacophora) foveicollis, R. abdominalis, and R. frontalis (Coleoptera: Chrysomelidae). Diseases Tomato diseases Fungal wilt caused by Fusarium oxysporum and Early Blight of tomato caused by Alternaria solani are common diseases. Late Blight of tomato caused by Phytophthora infestans produces symptoms similar to that of potato. Septoria leaf spot is caused by Septoria lycopersici. Fruit rot of tomato in the field or in transit may take place due to attack of Phytophthora infestans, Alternaria spp., Fusarium spp. and Aspergillus niger. Bacterial wilt of tomato caused by Pseudomonas solanacerum is a major vascular disease. Stem and Fruit canker caused by Corynebacterium michiganense and Mosaic of tomato caused by common tobacco mosaic virus are prevalent all over the world. Leaf curl of tomato caused by tobacco leaf curl virus is transmitted by the white fly, Bemisia tabaci. Brinjal (Eggplant) suffers from a number of diseases caused by fungi, bacteria, nematode and phytoplasma. 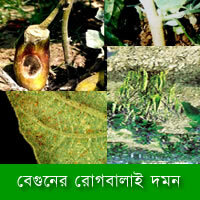 Vein clearing disease is the most destructive disease of okra in Bangladesh. Leaf veins and veinlets at any age of the plant may turn yellow. The disease spread very fast due to transmission by the insect vector, Bemisia tabaci. The leaves, flowers and fruits are affected resulting deformed fruits and poor yield. Cabbage disease Damping off caused by Pythium and Phytophthora usually occursat the nursery. The seedlings are affected and ultimately die. 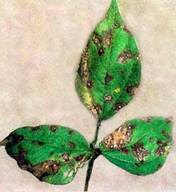 Black rot is caused byXanthomonas campestris. Club root symptoms are caused by Plasmodiophora brassicae. Most of the diseases reported on cauliflower are also common on cabbage. The common diseases of different cucurbit vegetables include Powdery mildewscaused by Erysiphe cichoracearum; Cercospora leaf spot or grey spots; Mosaic of cucurbits caused by Cucumis; Downy mildews caused by Pseudomonas cubensis and Peronospora pisi; and Cottony leak caused by species of Pythium,Phytophthora, or Fusarium either singly or in combination, may occur in most of the cucubits, under field conditions or in transits. 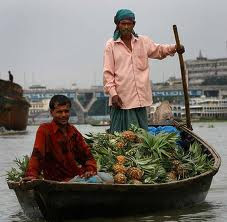 Vegetable farming in Bangladesh.map of Bangladesh.culture of Bangladesh.vegetable list .